Abstract: Why do states acquire nuclear weapons? Existing theories of nuclear proliferation fail to account for the impact of bargaining on the process—i.e., credible agreements exist in which rival states make concessions to convince rising states not to proliferate. This book proves the existence of settlements and the robustness of the inefficiency puzzle. It then provides two main explanations as to why states proliferate anyway. First, if the would-be proliferator expects to lose the ability to construct nuclear weapons in the future, the states face a commitment problem: the rival state would like to promise to continue providing concessions into the future but will renege once proliferation is no longer an option. 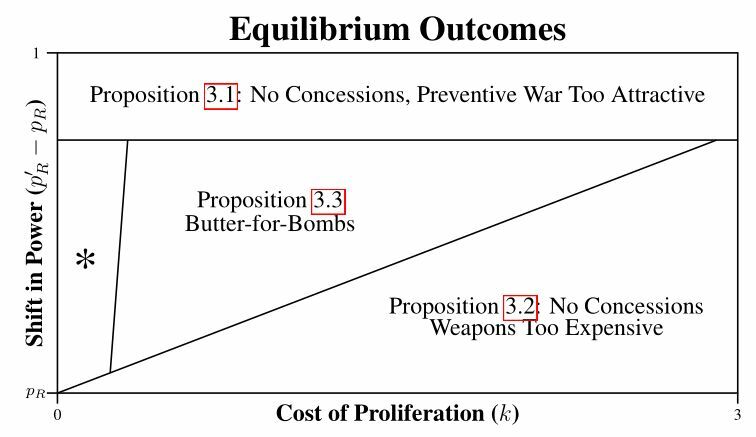 And second, if the proliferator’s rival faces some sort of uncertainty—whether regarding the potential proliferator’s ability to go nuclear or regarding its previous proliferation activity—the optimal offer can entail positive probability of investment. In production at Cambridge University Press.